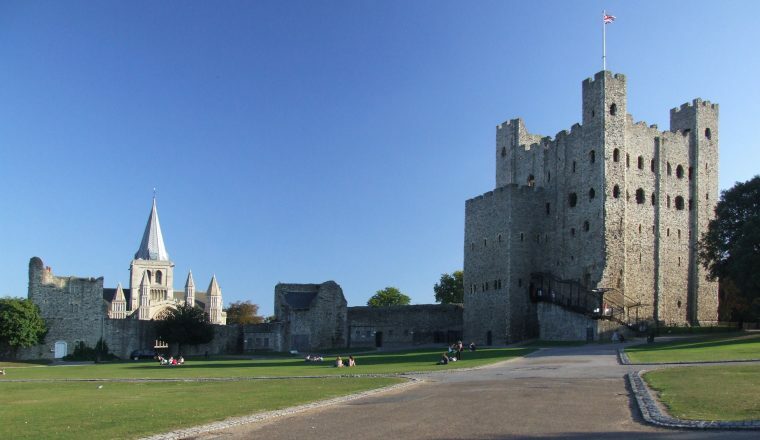 Visit the Historic Canterbury Cathedral, Rochester Castle and the countryside of the ‘Garden of England’ on this classic walking route. The North Downs have acted as a highway since before Neolithic times, but became busier following the murder of Archbishop Becket in 1170. By the eighteenth century, the term ‘Pilgrim’s Way’ referred to ancient trackways in the south of England used by pilgrims in the ‘Canterbury Tales’ but were prehistoric tracks used by pilgrims travelling to or from the continent via Dover along the Via Francigena.The principal pilgrim route ran between Winchester and Canterbury, much of which is now busy with traffic and therefore is no longer a viable walking route. Nonetheless, our route, a section of the North Downs Way, does coincide with some of the places that Chaucer’s pilgrims visited and parts of the pilgrim way marked on maps. Overall, this is a gentle walk, with beautiful views below you across the ‘Garden of England’, as well as a historic route leading to England’s most eminent cathedral city. Five nights’ accommodation in inns and hotels (see additional information for hotel list), luggage transportation on walking days, route notes and maps. This section may also be walked over 4 days. Please ask. Extra nights are possible along the route – please ask. If you wish to do the full North Downs Way from Farnham to Canterbury, please contact us. Similarly, we also offer the Canterbury Loop (Canterbury to Sheperdswell 10.4 miles, Sheperdswell to Dover 8.3 miles, Dover to Etching Hill 13 miles, Etching Hill to Boughton Lees 11.5 miles, Boughton Lees to Canterbury 13.1 miles). Overnight in Rochester or nearby Chatham with its historic dockyard. The following morning you begin your walk from Rochester. This historic town has a magnificent cathedral (the second oldest in England) and a well-preserved Norman castle, as well as many associations with Charles Dickens. Undoubtedly, Chaucer’s pilgrims would have come through Rochester, close to which the North Downs Way passes today. Cross Wouldham Common, pass Kit’s Coty Neolithic burial chamber and the White horse standing stone along paths and fields to Boxley Church. East of Kits Coty, a long stretch with distant views delivers the North Downs Way to Detling Hill, beyond which a sudden return to open country shows the vast expanse of the eastern Weald spread below. The trail tucks round the outline of Thurnham Castle, from where you leave the trail for the short walk to The Black Horse in Thurnham. Approx. 12 miles/19 kms. 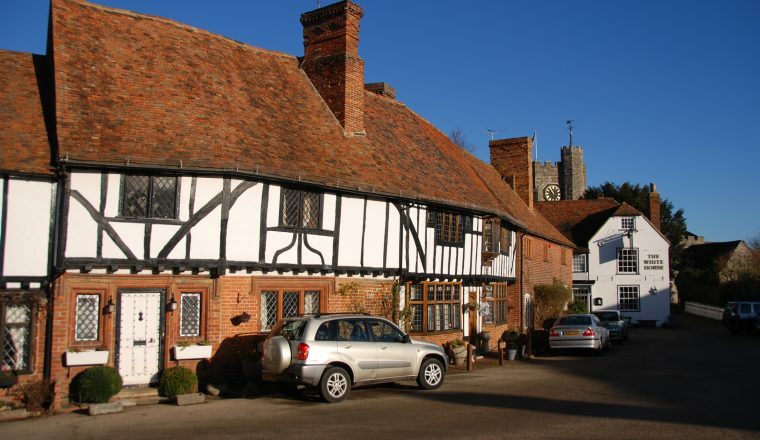 Re-join the route at Thurnham Castle and walk on to Hollingbourne, from where you follow a gentle route for many miles to Lenham where you overnight (8 miles / 13km) or the lovely medieval village of Charing. The route continues to Boughton Lees and then enters Kings Wood, where pilgrims traditionally gathered together in medieval times to try and avoid robbers. Glimpses of Canterbury Cathedral can be had in breaks in the trees. Our final night before Canterbury is spent in the lovely small village of Chilham. Approx. 15/11 miles. We can shorten the walk today using a taxi transfer to Boughton Lees, making the walk from there to Chilham 6 miles. Our tour finishes after breakfast. It is possible to extend your holiday by booking additional nights which we will book if requested. Carefully selected B&B’s and Inn accommodation. 5 nights accommodation, luggage transportation on walking days, transfers as needed for the walk, route notes and maps. UPGRADES TO HOTELS POSSIBLE IN SOME INSTANCES. THIS SECTION MAY ALSO BE WALKED OVER 4 DAYS – please ask.